Two cities. 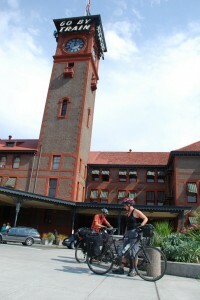 Two train stations. Two completely different vibes and messages. Walk outside the doors and you see the Greyhound station 500 feet away. A light rail train glides by. Bike paths with signage pointing you toward downtown are clear and highly visible. Wide sidewalks too. 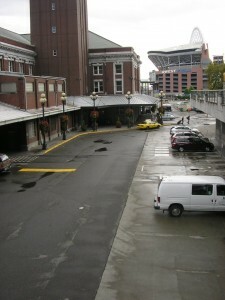 Walk outside the doors and … you are greeted by an ENORMOUS parking lot for Qwest field. A few taxi’s are waiting at the curb. Yes. Seattle has bike lanes and local bus service, even light rail. But where are they? I guess you have to be a local to know that the Greyhound station is across town. No easy bus connection and a very long walk with baggage. The bus tunnel and light rail are a couple of blocks away … but that appears to be privaleged information as well. First impressions? As a cyclist or pedestrian, Portland embraces you … while Seattle tolerates you. The station is still being upgraded. once the project is complete, it will be far better than Portland’s. The station is being upgraded, but the points about the lack of clear and close connections are still valid. Seattle has a long way to go – and we sometimes seem to have mixed feelings about committing to making improvements.